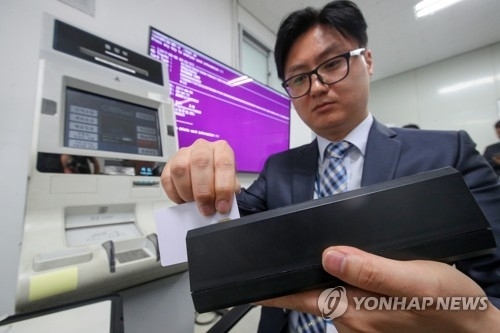 SEOUL, Sept. 6 (Yonhap) -- Police said Wednesday they arrested three South Koreans and one Korean-Chinese national for making illegal transactions using personal data allegedly taken from ATMs by a North Korean hacker. The National Police Agency said it has detained the four suspects, including a 29-year-old man, only identified by his last name Cho, and sent the case to the prosecution. They are suspected of buying some 238,000 pieces of private information from a broker, selling them here and abroad, and making transactions or taking out loans using the cloned credit cards. The amount of damage from the scheme roughly stands at 102.6 million won (US$90,370), according to the police. In March, the police launched a probe into the case after the servers of over 60 ATMs operated by a local ATM service provider were attacked from an unidentified source. The investigation found out the traces of malware used in the hacking were similar to those revealed in the series of cyberattacks on government websites by North Korean hackers last year. The police said one of the suspects stated he obtained the private financial data from a middle man who claimed he got the information from a North Korean. But the exact amount of money they paid to the alleged North Korean hacker is yet to be determined given the evidence secured so far, the police added. The police said they plan to track down the broker and another Korean man involved in the scheme by requesting joint efforts from international law enforcement agencies.